Formulated by experts to contain all essential nutrients as found in natural environment. 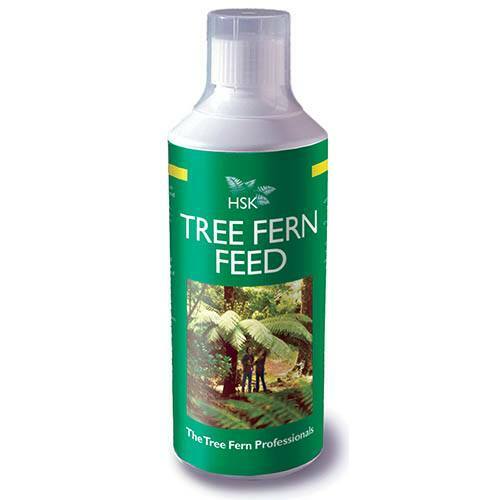 Tree fern specialists HSK have developed this specific concentrated Tree Fern Feed to get the best results from their wonderful tree fern logs. In their native habitat, tree ferns grow in dense shady wooded areas, beneath the main tree canopy. Leaves falling off trees gather in the crown of the tree fern, and mix with rain, slowly feeding the top of the log, where the new fronds emerge. This is unlikely to happen here in UK gardens, even in shady areas, so this specialist tree fern feed mimics the nutrients provided in their habitat, with a balanced feed to encourage strong frond growth. Feed every week or so in growing season (May til September), this 500ml will last a least 2 years if used as per the label. It can also be used to feed any other garden ferns in shady locations. Supplied as a 500ml concentrate feed, specifically designed to feed ferns. Directions Shake before use. Mix 10ml of Tree Fern Feed to 2 litres of water and apply directly to the crown (top) of the tree fern, feeding once every week during the growing season.